Whether we are introverted or extroverted, we all have a tremendous need for community. This deep connection and understanding feeds our souls in ways little else can. The surface-y chit-chat we usually encounter can’t even come close to meeting this need. We really shouldn’t be surprised. We are made in the image of God. And even God needs community. Some people assume this is why He made us: for community. However, this isn’t even remotely correct. It presumes that God is thus dependent on us, His creation, to meet His needs. God created as an outpouring of His amazing character, not because He needed any of creation. If He did, He couldn’t be the omnipotent God that He is. He Himself is the perfect example of self-sustaining harmony that He is. As much as I know the Trinity is crucially import, it is confusing (as it should be since God is so completely infinite that finite being like us have trouble understanding) and we tend to shy away from it or even deny it, tragically. Since God is One and yet God the Father, Jesus Christ, and the Holy Spirit, He exists in a state of perfect community. God meets His own needs through Himself and out of His perfect love for Himself and His community, He created us with a profound need for community. That’s where this gets hard. We, as flawed people, aren’t very good at community. We can be prickly, self-focused, and ignorant. We also let life get in the way. This is where I struggle the most: when I’m in the midst of a fibromyalgia flare-up, community is one of the first things to go. I’ll focus on the bare minimum and I seem to fall off the face of the planet. Ironically, the support, understanding, friendships I neglect to nurture, I’m actually cutting out one of the things I need. Without community, we really have a hard time growing. It is the whole “Iron sharpens iron, and one man sharpens another” principle in Proverbs 27:17 (ESV). We need the body of Christ to help us be the people we are supposed to be. That is a far cry from the person in survival mode that I become. Even more ironically is that the cycle continues that the more we isolate ourselves, either intentionally or unintentionally, is that the more that breeds isolation. The silver lining of my chronic illness, though, has made my experience of community much deeper. I don’t have time for the fluffy small talk that our society seems to thrive on. And by thrive, I really mean pretend life is wonderful on the surface and then wonder why we feel so lonely. I don’t have nearly the energy that I would like so I have to be extremely intentional and that means intentionally connecting with people in a God-honoring way. Truthfully, I think we can get caught up for community simply for community’s sake and get lost in the fluff along the way. If we are looking at community as God sees community then He is our focus in all our relationships just as He should be. This is even true of our relationships with people who don’t believe as we do. It looks a little different, but we should always want the best for that person and need to spend our time well with them. My friendships really can be only as good as my relationship with God is. The person I am in community is the outpouring of my relationship with God, just as God’s community in His character outpours into all of us. That’s why my community and prayer with Him is the starting point for all others. Hence I’m so thankful for my friend who understands my life with chronic illness and we can spend such great time encouraging one another. I just wish the coffee shop stayed open later! Well put! And so very true–from the bits about our need for fellowship and that tendency to drop off the face of the planet at the very time we need fellowship and encouragement to the reality that God doesn’t need our community. I am so thankful, though, that He enjoys our worship and our prayers and our need for Him. Love your questions about connecting with others in a God-honoring way. Thanks so much, Natalie! I am so thankful too that God relishes in our worship and desires a relationship with us; I’m so humbled by the fact that He relishes in our worship and desires a relationship with us even though He doesn’t need it. It is truly amazing! I love how you stated that! So easy to fall off planet or only talk on surface level, I am so guilty of this. I love your questions– am I pointing other towards God and listening with intent. I think you do a wonderful job and I love to be around you! Thanks so much, Brandi! I love being around you too and feel so thankful that baby girl has you loving on her in the nursery 🙂 I love that I can be real with you and how you are so deep! I’m so sorry you have fibro too, Pamela! I’m so glad that you have some friendships like this too since it is a hard thing for people to sometimes understand if they aren’t living with it or know someone close to see it first hand. If we pretend everything is okay when it really isn’t, we are really doing those around us a disservice since we deny them the opportunity to really understand. It took me far too long to learn that though! That is wonderful though how you are making a difference with sharing your story- you are so right that authenticity is absolutely crucial. I’m looking forward to reading your posts! I love this: “We, as flawed people, aren’t very good at community.” What truth in that statement! I have always struggled with finding community- wanting it, but letting my introvert personality keep me from it. The internet has been a wonderful asset for me. Finding community online has helped me to venture out into real life friends and groups a great deal more. SL this is such an important message. We are becoming more and more disconnected as we rely on texts, email, and fb to keep in touch with friends and family. You’re also right in that often when we’re hurting the first thing we do is pull back from our relationships. Loving Him and each other is where we find our strength, encouragement, and hope. Thanks so much for visiting CMB, you have a new follower. Deb, thank you so much! I loved visiting your site! I definitely agree we are becoming more disconnected- I can spend way too much time on fb and really not interact with anyone and delude myself into thinking I’ve been “social”, but the connection really isn’t there. These things can be good tools especially given the distance between me and some family members, but they are simply tools and it can’t be those things only. I appreciate your wisdom and I’m so glad to connect with you! Very well said!!!! It is such an important message that we really have to FIGHT for. We have an enemy who doesn’t want us to connect.! Thanks for sharing. So true! If we aren’t intentional, a million other things will happen to get in our way! Thanks for visiting! I so identify with this. I lack community sometimes because of my chronic illness. You are lucky to have a good friend to share with. I’m so sorry you struggle with chronic illness too- I wouldn’t wish that on anyone. I do feel so blessed to have some great friends who understand. I’ve found some amazing friends too through Rest Ministries since there are online groups in what they call their sunroom. I feel so privileged to write for them and there are links to that ministry on the chronic illness page on this site. It is a great place to start when looking for some people who understand. I’m so glad you came and I’ll be praying for you too! Several years back, I lost my best friend of 20 years to breast cancer. She was a sister in Christ who really helped me open up & share in Christian community. Your post reminds me that I need to find ways to do that even tho’ she is gone & not close myself off from others. Thanks for sharing this! Blessings! I’m so sorry for your loss, Renee! I lost a dear friend a couple years ago far too young to cystic fibrosis and I still miss her too. I’m so thankful that I had her friendship as long as I did though since she really encouraged me in Christ and I’m sure it is the same for you and your precious friend. You are so kind that I am sure there are many friends blessed to have you, though. Thanks so much for visiting and sharing your story! I so relate to this great post! Those of us with chronic illness can be very selfish because we are the only ones that can take care of ourselves and get through the current flare-up. It is a rare friend that understands our need to retreat when not feeling well and not take it personally. I only have a few of them. I have been accused of not being a good friend because I am always sick or going to the doctor. It was said by a needy friend that always wanted it to be about her! I am very private about my ailments and so tend not to reach out when I am not feeling well. It is an ongoing battle that I take one day at a time. I totally understand, AnnMarie! It is hard to find that fine line sometimes between being authentic without dumping on someone and those of us with chronic illness tend to do that since it feels like there is so much on our plate at times. That happy medium between saying nothing and complaining can be elusive! I feel so thankful for friends who understand and know that I just sometimes have less to offer when I get sick since I just need time to get healthy. That is so frustrating when someone like your friend says things like that- ironic really! I’m so sorry, but I am glad that you have a few good friends who get it. I’m so thankful that even during the difficult times, God is always there! Love community! So true. So important! Finding community is hard, especially for those of us that are introverted! 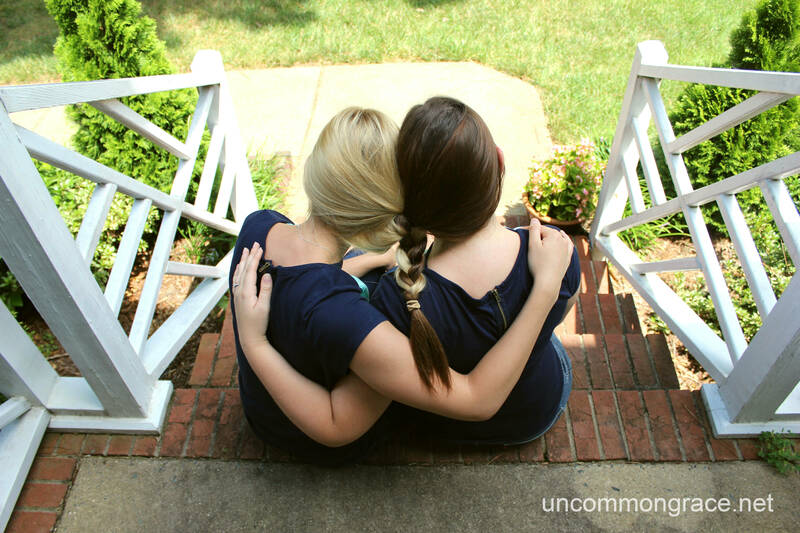 Thankfully God has given me friends in my life that are much like the friend you described above – we can chat for hours and it feels like a few minutes! Totally agree! My middle son is pretty introverted and only has a couple friends, but they are all fiercely loyal to each other. The huge plus for that though is that his friendships naturally run really deep and that really inspires me to follow his example. I’m so glad that you have friends like this too! God is so good! What a wonderful and true post. I am a bit of an introvert. I have one really good friend and yearned for community but wasn’t sure how to get out of my introverted head to connect with others. I forced myself to attend Bible studies, prayed for spiritual companionship, yet for a while it was a lone venture. Then my best friend became Christian. The way we connected was amazing. We were best friends before but to have those deep spiritual discussions, to pray for each other, to build each other up… it has been a glimpse of heaven. I find that I have gotten way better with connecting and community now. Outings that used to be exhausting are invigorating, especially if they involve making spiritual connections. Thanks so much for visiting, Jennifer! I so agree that having that spiritual connection is so important for a deep friendship because it impacts so much and really transforms relationships! So wonderful to have this connection be such an encouragement for you and for you to be able to build each other up! I love this as a picture of how God has designed community! This is so encouraging to me too! I really related to this. Community is so important. Thanks so much, Jill! I’m so glad to have you stop by too and get to connect with you! Thank you for linking up with WYWW… this is so true and an encouragement! Just today I was blessed with time to talk to two different friends during my little one’s nap. I am an extrovert, but I am also very performance driven… so when it comes to phone calls, sometimes I have to force myself. Stop to take the time to partake in the gift of community, of so many Godly women I can connect with! Hope you link up again! I am excited to read along! i love this post! i’m very picky with friendships and like to have few meaningful ones. Thanks so much, Gen! I’ve been so blessed by the Godly relationships that God has placed me in. I hope that you can find the same thing! Thanks so much for visiting- I’m so glad you came by! WOW!! Love this post…your writing, your heart, the truth spoken through you. Thanks for sharing with What You Wish Wednesday Please come back tomorrow for another link-up! You are so sweet, Leslie! I really appreciate your encouragement! I am so glad that you stopped by!